The work of British born, American based artist Adam Fuss is imbued with a metaphysical and spiritual cadence. Fuss distils the vast concepts of life, death and transcendence into allegorical fragments. Using unconventional photographic processes, producing daguerreotypes and photograms without a camera, Fuss engages with photography in its most elemental form and extends its ability to create poetic images. 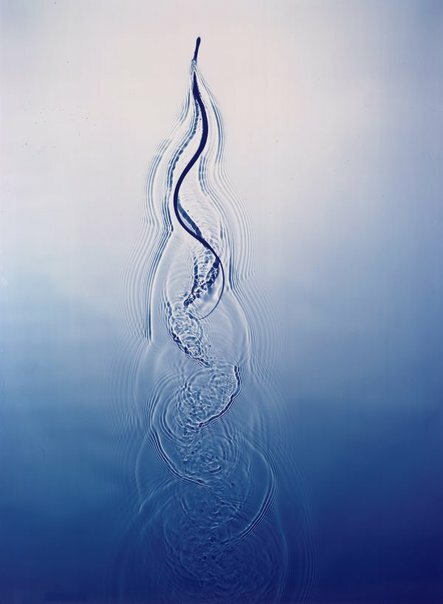 Much of his work, including this unique Cibachrome photogram, explores states of transience and transformation, using natural forces like water to create apparitional environments. Fuss’s enigmatic photographs often enlist elements of the natural world as symbolic talismans. The snake is a motif he has returned to throughout his practice. In accordance with the complex role snake iconography plays in cosmology and theology – wherein snakes are used to signify life force and rebirth or serve as a cosmic binding agent – Fuss’s snake photographs possess a profound spiritual dimension. In this work, the snake appears as a shadow. We identify it purely through form and movement – registering its distinct gestures through the ripples of the water. In its upwards propulsion, this ghostly snake appears almost weightless. It levitates, emerging from the darkened depths of the image plane towards the light. Perspectival logic is upended; while the image depicts the snake’s horizontal path through a shallow body of water, it looks as if it were flying. The work is less a portrait of an animal than a study of forces. Set against the placeless – yet resplendent – background, the snake’s graceful movement translates the very notion transcendence into legible form.